NIYA recognized the first bow-steering iceboats at its 1936 regatta. These were the Skeeter-class boats, and Harry Melges Sr. won the inaugural NIYA Skeeter title aboard Mickey Finn. That same year, his son got his first sailing dinghy, and the rest is history. Kestrel, a mini-skeeter, waits for the starting gun on black ice. 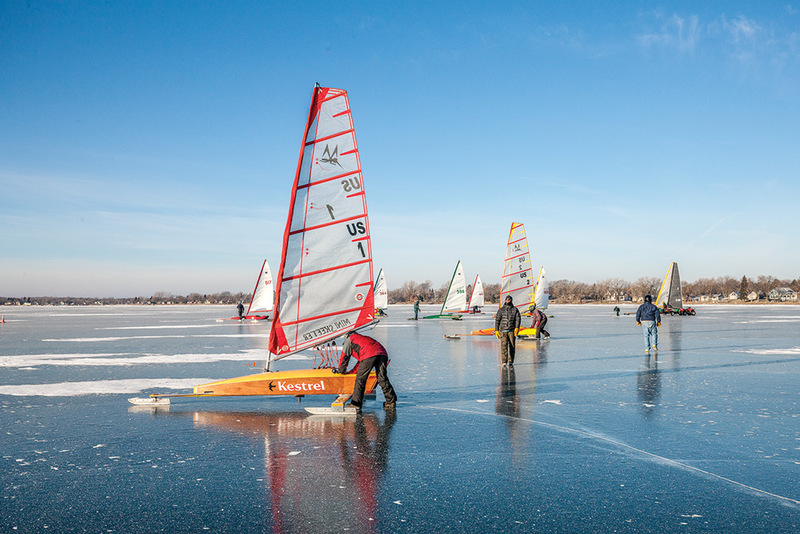 Many iceboaters, like Pegel and Melges, are now in their 80s. Others are middle-aged, and some of their children are following them into the sport. Yet Orlebeke said he is witnessing a decline in participation, with the exception of the DN class. He said he sees a bright spot with John Eisenlohr’s development of the Mini Skeeter. In Eisenlohr’s own words, he is a “third-generation iceboater and second-generation dirt boater” whose grandparents and father sailed E-scows and iceboats on Wisconsin’s Lake Delavan. 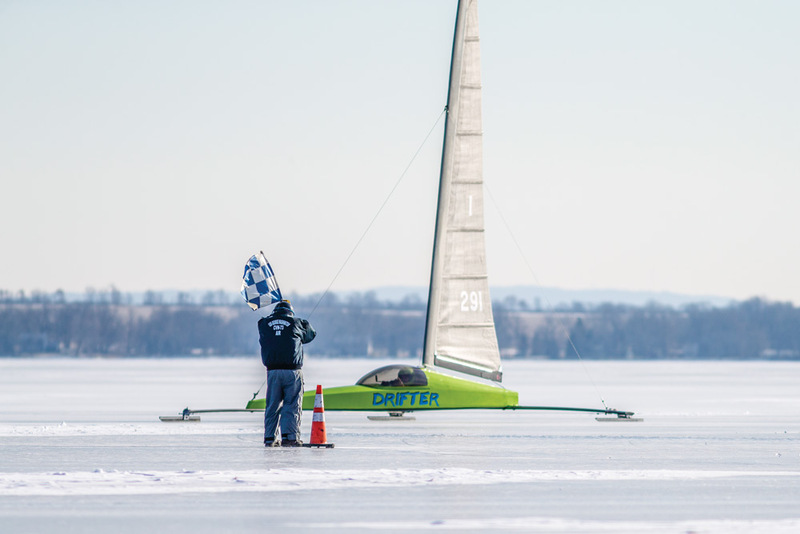 Now based in Montana, he developed the Mini Skeeter for both land-sailing and iceboating. In the latter case, it only needs about a half-mile plate of ice. “It’s a smaller design, it’s less expensive and it’s easier to deal with,” Orlebeke said. That might prove appealing to young people, especially those who desire that distinctive blend of thrill and fear that iceboating offers. After all, there’s nothing quite like racing across a frozen lake. “I’m addicted to speed,” Orlebeke said, reflecting on his own 20-year journey. “It’s pretty cool. I love that this allows you to sail all winter. I love the adventure of it, how the ice is dynamic and always changing. Another aspect I enjoy is that we build a lot of our own stuff—hulls, runners, runner blanks. The class C Skeeter Drifter takes the checkered flag.